Martin first came to Soho as a young conscript of the National Service,in the company of his friend Johnny Moynihan,son of painter Rodrigo.He worked with David Archer in his Parton Street bookshop,published a literary periodical,'Nimbus' from 1951 -58, & made many friends in Soho,before working for publisher MacGibbon & Kee, & later still setting up his own imprint in Bloomsbury near the BM: 'Martin Brian & O'Keeffe'. A brave & ambitious thing to do in the 60's with very little money.Supported financially by their wives, Martin,Tim & Brian were pioneers & had huge support from people like Patrick Kavanagh,the emminent Irish Poet, & writer Colin MacInnes,both of whom left their publishers to follow Martin's venture.But bravery was in his blood : his parents had fought in the Spanish Civil War ** with the International Brigades. He was briefly engaged to Henrietta Moraes,muse of Bacon & Freud. Later however,we married & we lived in Fitzrovia with our two children for 20 years, where we held open house for writers & artists from all over the world. You might have met Thabo Mbeki,later to become President of South Africa talking with Robert Graves or Michael Foot with William Crozier.Martin published a poetry quarterly from home,'Two Rivers' with poet Paul Durcan in 1968. Martin has since brought out 8 poetry books of his own,& 4 plays. He had six children & lived in Newlyn,Cornwall. 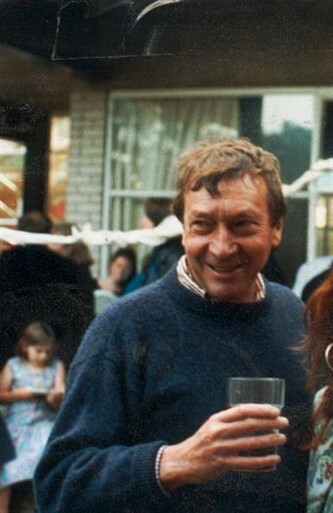 He died in St Austell after a short illness on 4th February 2015, & leaves behind two sons : Crispin & Barney & four daughters : Cathy,Polly, Katie & Daisy & eight grandchildren. This page was added by Fiona Green on 03/03/2012. I worked with Fiona when she was a teacher near Kings Cross and stayed with her and Martin for a while in the early seventies. So lovely to see a photo of Martin - reminding me of some good times. While sifting through old papers I found a letter from Martin your father written to me in 1986! I'm ashamed to say that do not remember replying, although we had corresponded before this due to our friendship with the Swifts. I got to know Patrick and Oonagh when living in Algarve.